Thanks to the need for the rider to have unmatched balance, unicycles have never been a popular form of transportation. 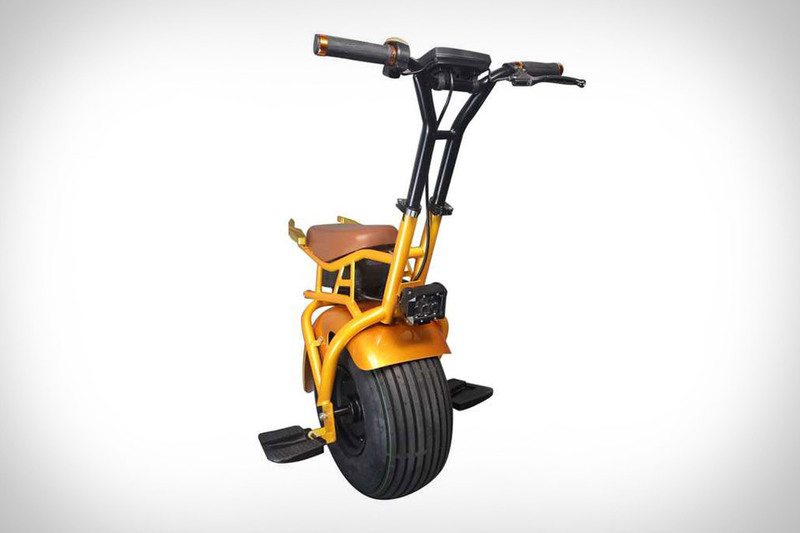 The Uno Bolt Electric Unicycle is out to change that. Thanks to its gyroscopic stabilizer system, it makes riding as easy as leaning in the direction you want to go. Its electric powertrain gives it a top speed of 22 mph and a range of 25 miles per charge, and its compact body and light weight make it easy to move around. It keeps you visible at night with a powerful LED flood light on the front and twin LEDs on the rear, its all-terrain tire handles rough roads with ease, and the integrated parking stand means you don't need to find a wall when you're done riding. Sleek and powerful, the Evo WA Extendable Yacht can make your day on the water more enjoyable than nearly any craft its size. It starts with its namesake "walk around" deck that lets you move quickly between the bow and stern. The stern also transforms into a huge beach area thanks to walls that open hydraulically in under 30 seconds, creating over 25 square meters of space. The area can be outfitted to match your needs, with options like chaise-lounges, cushions that double as floating pads, and a retractable cooking area. Under the deck, you'll find two cabins and one bath, and the entire rig is controlled from a single iPad at the helm. Powered by twin Volvo Penta engines producing 435 hp each, it's capable of hitting a top speed of 40 knots, with a cruising speed of 32 and a range of 300 nautical miles. Built as a tender for larger superyachts, the Mazu Thirtyeight Yacht is a capable day cruiser in its own right. As the name suggests, it measures 38 feet long, with a 12-foot beam. The open deck plan includes an aft dining area, a bimini, deck shower, and a retractable swim platform. Underneath, you'll find two galleys, Gaggenau appliances, an en suite bedroom with full shower, and a crew cabin. Powered by your choice of Volvo Penta diesels, it has a cruising speed of 30 knots and can hit 45 knots at the top end, with the hand laid carbon hull ensuring a smooth ride. Electric bicycles are all the rage. From high-tech offerings like the Neematic FR/1 to the more casual Pedego Airstream, there's something for every purpose and budget. Avionics is on the verge of releasing their own electric bike, each one of which gets its own custom name. The distinctive look walks the line between minimalist modern and decidedly retro, all accented with parts made from Jatoba wood. The battery and motor case, brake levers, fork covers, seat, and headlight bucket are all made from the extremely tough wood. But an electric bike wouldn't be electric without a motor. The Avionics features a 5,000 watt brushless DC engine, capable of a frame-bending 92 ft-lbs of torque and 75 miles of riding. Preorders start in September of 2017. For over ten years, Pirelli and Tecnorib have collaborated to design three different boats. The newest and biggest in this line is the 1900, scheduled to be officially unveiled at the Cannes Yachting Festival. It measures 61 feet long and just over 16 feet wide, but despite its size, it still maintains a sporty feel, with a carbon fiber roof, twin 800 hp engines, surface-piercing propellers, and the inflatable rubber tube is adorned with tire threads in true Pirelli fashion. It tops out at around 52 mph, but recommended cruising speed is closer to 35 mph and also features two cabins, two bathrooms, and a central living area. Designed for short trips on the sea, the Alen 45 Day Boat replaces the well-received 43-foot model in the yacht builder's lineup. The majority of the deck is coated in teak, while a grill, fridge, and wet bar let you cook up delicious meals. Interior space is kept to a minimum, yet there's still room for a bedroom, full-size bath, and small kitchen, and sunbeds on both the bow and stern offer plenty of space for relaxing outside. Powered by twin Volvo IPS 600 engines, it has a top speed of 38 knots and a range of 300 nautical miles, and the steep composite hull handles rough waters with aplomb. Completely electric — and thus nearly silent — yet capable of extended voyages, the Trondheim Trawler is a one of a kind vessel. It comes in sizes ranging from 30 to 43 feet, with the ability to handle waves over 13 feet high and winds over 40 knots. Range per tank is over 900 miles in the smallest model and over 2,500 in the largest, and Scandinavian design means the interiors are as stylish as the outside.